There are few people with more diving tales to tell than Rod Macdonald – and luckily for us he’s happy to tell them, with the simultaneous release of two new books this summer. Deeper into the Darkness is the newest account of Rod’s life underwater. It takes us to many famous wrecks around the UK sunk during World War 1. These include HMS Pathfinder, HMS Audacious and HMS Hampshire, on which Lord Kitchener perished on a secret mission to Russia in 1916. The book also recounts dives on wrecks in the Pacific from WWII, when Rod visits the American shipwrecks from the Battle of Guadalcanal. Deeper into the Darkness is now titled volume III of The Diving Trilogy. The second book publishing shortly is Into the Abyss, Diving to Adventure in the Liquid World – which becomes volume 1 of The Diving Trilogy. Into the Abyss is a collection of Rod’s true-life diving adventures from around the world. 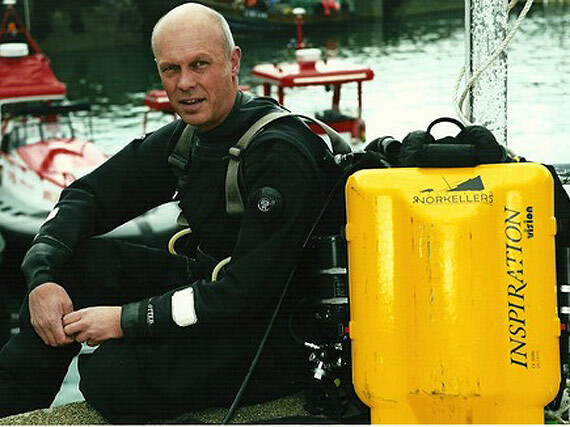 It follows his progression from a novice diver in the 1990s to when divers began to use commercial mixed gases as technical diving was born. Both books will be available from Whittles Publishing shortly – stay tuned for a review.